Our sweet Benjamin is two months old! It seems like time is just flying by but there are times when I look at him and think, you can’t sleep through the night yet? Weight: This chunker tipped the scales at 14 lbs at the doctor’s office yesterday. 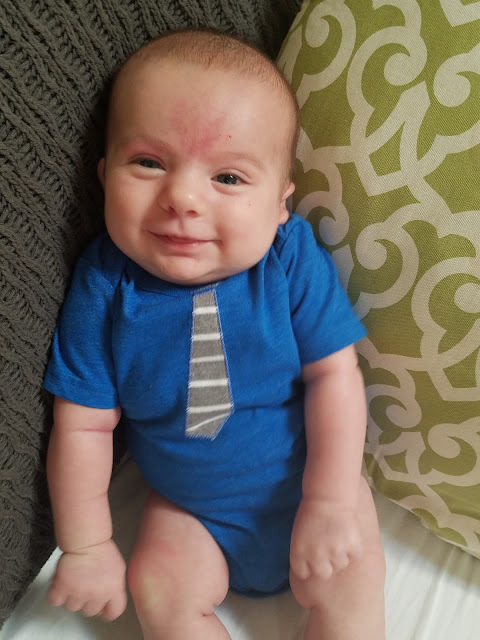 He is in the 90th percentile in both weight and height. I was shocked when I heard that because little Luke at 2 months was 50thpercentile for weight and 15th percentile for height. If Ben keeps this up, he will be as big as Brother by next year! Diaper Size: Size 1 diapers. We have one more box and then I think it is time to graduate to the next size up. Clothing Size: 3-6 month clothes. Health: He is one healthy boy! The only issues we have had with him this month is a stuffy nose occasionally. Nothing a little saline spray and the Nose Frida can’t fix. Diet: Formula all the way. We have tried feeding him some rice cereal in attempts for him to sleep longer but it proved worthless. Eating about 4 to 5 oz every two and a half to three and a half hours is about to drive this mama crazy. It amazes me how fast three hours can go! Loves: EATING. Being held, someone talking to him, his activity mat, sitting propped up so he can see what is going on. Dislikes: being put down, sleeping (David’s contribution! ), being hungry. Last weekend, Ben spent the entire weekend with GiGi and G Daddy and it was the longest time we had been apart. We are loving how happy and smiley this boy is. He is very “talkative” and acts like he really is telling you something. It is so fun to see how different he is compared to Luke. Ben is our social butterfly while Luke is more reserved and observant. You have always had to work hard to get Luke to smile at you. We skyped with Aunt Mariah in Zambia last week! 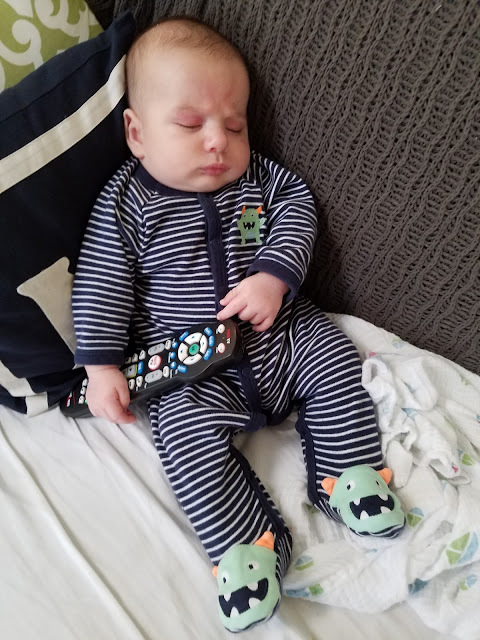 Watched his first NFL game last night…Go Broncos!